Gamba Osaka manager Kenta Hasegawa said he wanted to make the J. League title race interesting in Saturday’s game against Urawa Reds, and after watching his team blow the field wide open with a 2-0 win over the league leaders, his wish was certainly granted. Gamba ensured Urawa would not clinch the championship two games early at a packed Saitama Stadium, with substitutes Akihiro Sato and Shu Kurata pouncing late to give Hasegawa’s side a win that puts the destination of this year’s silverware up in the air. Reds now lead Gamba by just two points with two games remaining, with Kashima Antlers in contention two points back and Sagan Tosu still mathematically alive one point further behind. It could all have been so different. Reds looked dangerous as they went in search of the win that would have secured their first championship since 2006, with Gamba unusually subdued and Hasegawa withdrawing star forwards Takashi Usami and Patric in the second half. 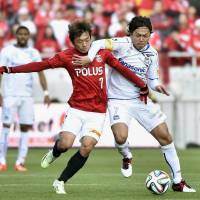 But with glory there for the taking, Urawa’s patience went out the window. The home side pushed men forward for a free kick deep in opposition territory in the 88th minute, only to see Gamba rampage through open space when Yosuke Kashiwagi’s kick rebounded to set up the counterattack. Gamba, on the other hand, will not want to change a thing. The incredible momentum that has carried them from the relegation zone at the World Cup break to two points off the top with two games remaining shows no signs of abating, and the end is now tantalizingly close. 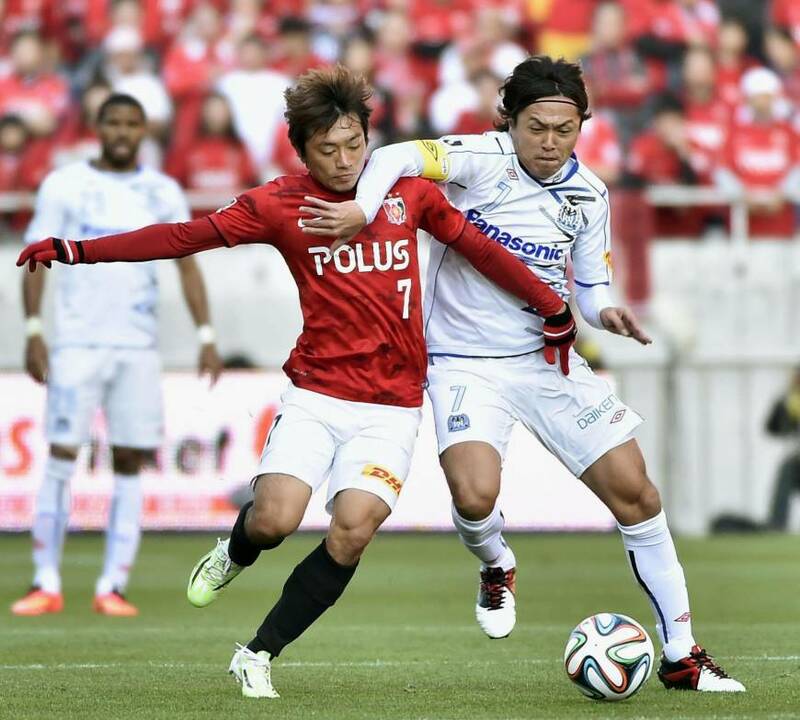 “Our aim was to get three points and we did that, so it’s very satisfying,” said midfielder Yasuhito Endo. “It puts pressure on them. We’ve got to win our last two games — that hasn’t changed. Given that Gamba’s final game is away to rock-bottom Tokushima Vortis — currently on 13 points from 32 games — a win for the Osaka side at home to midtable Vissel Kobe this Saturday would really turn up the heat on Urawa. Reds travel to high-flying Tosu on Saturday before finishing at home against 12th-place Nagoya Grampus, but given their recent patchy form, the league leaders can certainly take nothing for granted. The 2014 title race is still very much alive. Ventforet Kofu may not have made many headlines this year, but in securing their first-division status with a 2-0 win over Sanfrecce Hiroshima on Saturday, the Yamanashi club has pulled off one of the achievements of the season. Hideomi Yamamoto and Ryohei Arai got the goals that took Ventforet seven points clear of the relegation zone with two games remaining, continuing an impressive vein of form that has now seen Hiroshi Jofuku’s side win its last three matches. “We got some divine help today, but we’ve had a lot of games where we’ve had more shots than our opponents and created a lot of chances but still not come away with the three points,” said Jofuku, who will leave Ventforet at the end of the season having led the club to promotion in 2012 and kept them up last year. Cerezo Osaka may have temporarily escaped the drop last Saturday, but a 3-3 draw with Vegalta Sendai leaves the relegation noose tightening around the preseason favorites’ necks. A 93rd-minute equalizer from Cacau allowed Cerezo to fight another day, but defeat against Kashima Antlers this Saturday would send the club that signed star Uruguay striker Diego Forlan in January down to the second division regardless of how fellow strugglers Shimizu S-Pulse, Omiya Ardija and Vegalta fare. “It’s great that Cacau helped the team out with his super goal,” said Cerezo midfielder Takahiro Ogihara. “It wouldn’t have been unusual if we had lost when they scored their third goal (in the 88th minute), so we have to take this point in a positive manner. — Sagan Tosu’s Michihiro Yasuda foresees his team’s 1-0 win over Tokushima Vortis on Saturday.